Neonatal Abstinence Syndrome: A Public Health Reporting Gap : Shots - Health News Getting good information is critical to figuring out where resources need to go to treat newborns dependent on opioids. Pennsylvania relies on old and incomplete statistics, but that may be changing. How do you fix a problem if you don't know its size? Many states — including some that have been hardest hit by the opioid crisis — don't know how many of their youngest residents each year are born physically dependent on those drugs. They rely on estimates. Pennsylvania is one of those states. Ted Dallas, head of Pennsylvania's Department of Human Services, calls the information he's working with "reasonably good." "Data is never pristine when you're dealing with 2.7 million people," he says. "Do I think it gives you a good picture of the issues that are out there? Yes." Between 2013 and 2014 in Pennsylvania, Dallas says, about 3,700 of the babies on Medicaid, the government's health insurance for the poor and disabled, were born with neonatal abstinence syndrome. Statistics show that 31 died before their first birthday — and neonatal abstinence syndrome likely played a role in some of those deaths. Still, it's not all the data Dallas would like to have. The statistics are two years old, he says, and only count babies who are covered by Medicaid. That's just a slice of Pennsylvania's nearly 13 million people. More comprehensive, statewide numbers would have to come from Pennsylvania's Department of Health — and that agency isn't keeping track. With more complete information, Dallas says, the state would be able to better deploy resources as it tries to solve a health problem that's getting worse. With the right resources, there is an upside to this aspect of the opioid crisis: Babies with neonatal abstinence syndrome who get the right care usually do recover. But their care is expensive, and takes time. "These babies are very work-intensive," says Dr. David Wolf, who works in the neonatal intensive care unit in PinnacleHealth's Harrisburg Hospital. "Our nurses are on the front lines. They have to deal with the minute-to-minute symptoms." Cuddling or rocking the babies nearly nonstop is key to successful treatment, Wolf says, along with adjusting medication doses frequently in the first 48 hours of the child's life, to start the process of weaning these newborns off opioids. Each infant's stay in the hospital can stretch past two or three weeks, and can cost $10,000 or much more. Then the babies need follow-up visits. 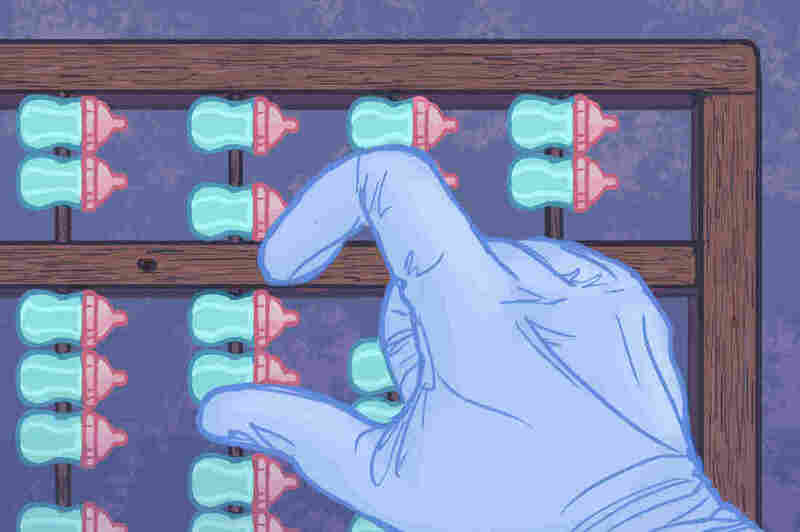 Pediatricians say that if the right agencies get real-time information, the babies are likely to get better care, and it's more likely that hidden roots of the epidemic can be identified and addressed. Pennsylvania might look to Tennessee's tracking efforts. Tennessee reacted quickly when doctors started seeing a lot more cases of neonatal abstinence syndrome in 2012, recalls Dr. Michael Warren, a pediatrician and public health specialist with Tennessee's Department of Health. "We were hearing from hospitals across the state, that they were really, really full," he says, "and in some cases, bursting at the seams." It's now mandatory for doctors and hospitals to report cases of neonatal abstinence syndrome within 30 days, and Tennessee made it simple for them to do so. "If you've ordered from Amazon or an online service and you've been able to do that, you can navigate this system with ease," Warren says. "And truly, at the end of it, you click 'submit' and that case is reported to us at the Department of Health." The data that started rolling in shattered a number of stereotypes. "I think sometimes there's a tendency to say these are just those moms who are using illicit drugs or buying those drugs on the street," Warren says. "But what the surveillance system has actually allowed us to see is that — in the majority of our cases — Mom is getting at least one substance that is prescribed to her by a health care provider." As a result, the state alerted doctors to the issue, recommending they try to change their prescribing habits, and offer alternatives to opioids, especially to pregnant patients. The evidence-based shift in prescribing recommendations only came about because health officials had solid data they could share. According to a 2014 report by the Association of State and Territorial Health Officials, at least a handful of other states have taken steps to get better, systematic data on babies born with neonatal abstinence syndrome. Pennsylvania Department of Human Services Secretary Ted Dallas acknowledges his state is missing out. "If we had better data generally, my theory would be we could make better decisions," he says. Just as I was wrapping up this story, the Pennsylvania Department of Health department called. Starting in July, officials there plan to start collecting data about all babies who are born dependent on opioids. The system to collect the information is still being developed, officials there say, but neonatal abstinence syndrome will be added to the Pennsylvania's list of reportable diseases, meaning that every time doctors diagnose a baby with the condition, they'll be required to notify the state. This story is the fourth of a four-part series Treating the Tiniest Opioid Patients, produced by NPR's National and Science Desks, local member stations, and Kaiser Health News.